Visiting Hollywood today with a few ten thousand others was not just far too colorful an experience, it was far too loud. But then I've observed that calm and peace do not seem to be things that many modern Americans seek. After walking the Hollywood Walk of Fame, and though we dipped into just one attraction, my head was buzzing and my eyes were popping. By the time we drove away, I craved a real piece of history, not to mention a real piece of peace -- just some simple remembrances of the sleepy dusty town where people from an entirely different world used to peddle their craft. A surprisingly futile and sad note to our LA film history tour has been the search for historical and cultural resources devoted to Hollywood's distant past. We realize that this is not a hot attraction for most people in the Entertainment Capital of the World, but with the billion or so people living on this stretch of coast, I admit I was hoping for a fairly large exhibit somewhere of early filmmaking memorabilia and resources. If such a treasure trove is here, I haven't found it. I do understand that Los Angeles Natural History Museum has a small exhibit dedicated to early film pioneers but we didn't get there; we did try The Hollywood Museum, an oddity that bills itself as the place for early movie fans. Although they claim 10,000 artifacts, I'm pretty sure most of those are photographs. Probably desperate to compete for the least common denominator that flocks down Hollywood Blvd, they've taken a kitschy, cram-packed, bizarre approach to old Hollywood that brought to mind the seedier aspects of the business - the focus on lifestyle, the desire to be more attractive at any cost, and the desperate search for fame. However there is one place, just up the road from the big time, that contained a piece of what I sought and that we were lucky enough to find. Feeling a bit raggedy and exhausted as we left Hollywood Blvd, it's lucky enough that we didn't get into an accident on the way home--profoundly luckier still that we stumbled right past a wonderful little barn called the Hollywood Heritage Museum. The only fault with the place is that it wasn't bigger. They are on just the right track with preserving and discussing the history of the industry that came to California and took it over 100 years ago. Chatting with the well informed and pleasant staff, using indoor voices and dressed in reasonable clothes no less, I realized that there really are others like me -- probably dozens -- and that we should stage the comeback of silent pictures. As the docent and I chatted, I thought about how the biggest stumbling block to people enjoying silence is a simple unfamiliarity with this style. But telling a story without audible words is not necessarily and absolutely a worse choice than telling it with. I mentioned The General as an example, he mentioned The Canadian, we both found that after watching these films and recollecting them later we couldn't quite remember their silence. They were simply so good that we didn't notice they didn't have dialog. We almost could have sworn there was sound because it was going on inside our imaginations. Hmmm... eerily reminiscent of the power of books, isn't it? But its true, silent film is no less a perfect form of storytelling, compared to sound movies, than reading books is compared to watching moving pictures. The amazing thing is, I'm sure we're not the only ones who feel this way. Silence may never attract the masses again, but the internet is buzzing with people who love the art form -- connecting people who still harbor a blazing interest in the types of pictures so soundly drummed out of Hollywood with the coming of sound. Although I'm willing to concede that in the late 1920s the technology of "sound on film" was a big advance, and an inevitable one at that, with possibilities far beyond what film with only visuals could do, it is sad that it so obliterated what silent film could do well. Silent film isn't about lack of sound. It is about fully filling the space in a film with story elements that are suited to a visual medium. It is not a less-than approach. It is a complete approach of its own. The acting is different. The camera movements are different. The way characters and scenes move is something that supplies direction to the story. After watching well made silent films, I simply never have been known to say to myself: "that was great. I sure wish it could have had sound." I'm always going to find places in my story where dialogue is not called for.... You get those stretches in your picture of six, seven, eight, nine minutes where there isn't a word of dialogue. In those, we did our old routines. Then, when it was natural to talk, you talked. You didn't avoid it. But you lay out your material that way, it don't call for dialogue.... The minute sound came in, it was everybody talking their head off and going for dialogue laughs. All your writers did the same thing. Once that started, it took years to ever get anybody even to even touch that type of material again.... I tried every so often. They started that off with a battle scene, cavalry plowing over the hill towards the camera, guns going, flags waving, heavy music -- very heavy music. Everything. The minute that picture started, it come on with a fanfare and a blast, from the time the lion roared on the screen - this is an MGM picture - the blast was on. Now, we would go out of our way to see how quiet we could start a motion picture. In other words, I wanted an audience to sit back in their seats at the start and get comfortable. Not bring em up on the edge of their seats with the title and the opening scenes of the picture, but put them back in their seats. . . . while we planted the plot and the characters. Then we let that come. To this day, I can't talk a modern producer into seeing it from that angle. And if Buster were still around I wonder if he'd still be futilely trying? Maybe the pendulum would have started swinging sooner, but it seems to me that it is slowly swinging now. Do you ever feel that you are on the verge, the cutting edge of a movement about to happen? A resurgence of silence seems almost possible. 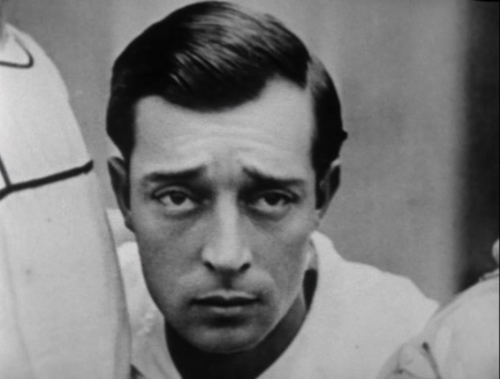 I've been reading a lot about Buster Keaton on the internet lately and I notice people say things like: "do you remember a couple of years ago when no one was talking about Keaton?" Now, go on to tumblr and type "Buster Keaton" in the search box and see how many pages come up. Young people are starting to fight about who was better, Chaplin or Keaton. Silent film festivals are popping up all over the country. New dvds and blurays are getting issued all the time. And people are starting to talk about, er, not talking. For instance, Martin Scorsese's celebrated 2011 film Hugo presents a unique kind of story with an homage to silent film. A wonderful short, silent film, La Luna, is currently getting mass exposure playing before Disney's Brave in theaters. And maybe even more exciting, for the first time since 1929 and for only the second time ever, a silent picture (The Artist) won the best picture Academy Award. These films celebrate early cinema or practice a different, more subtle type of storytelling. I can only hope that more people will start paying attention to the beauty and peace of telling a story that isn't designed to bombard our senses and smash our intellects into submission. Films that are slower, more intelligent, that make you work just a bit harder and that make you feel proud to have viewed might not appeal to everyone. That's OK. I don't need them to take over the world. Just one tiny little corner of it again would be nice. Thanks so much! And thanks for your other comments! I just found your blog & it's amazing. I do remember no one talking about Buster years ago. Making my own gifs, taking my own stills from movies on my computer. I was the only one in high school upset the film teacher skipped showing us Buster's The General in favour of going over Chaplin. I haven't looked him up online in a loooong time but I'm so glad I found my way here. Thank you so much for your kind words! Glad that a kindred spirit found your way here too!